Takes 5 minutes plus 3 hours to overnight for freezing , serves 1. Place all ingredients in a blender and puree until smooth. Pour into a glass and serve immediately. The thought of bananas and peanut butter makes me sick. This one is not for me. 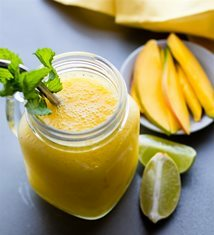 I love mango but not sure how I would like it with pb.